February 29, 2012 - Alaska Airlines will serve as the official airline sponsor of the Iditarod Trail Sled Dog Race, marking the 34th year the carrier has supported the event. "We are proud to be a sponsor of the Last Great Race," said Marilyn Romano, Alaska Airlines' regional vice president, Alaska. 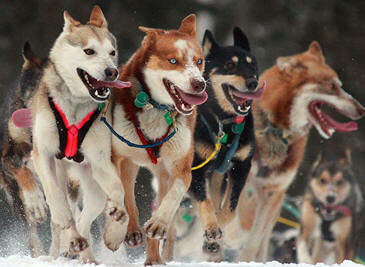 The Iditarod Trail Sled Dog Race is an annual sled dog team race across Alaska. Mushers and a team of 12-16 dogs (of which at least 6 must be on the towline at the finish line) cover over 1,049 miles in 9?15 days from Anchorage to Nome. The race begins on the first Saturday in March. The Iditarod began in 1973 as an event to test the best sled dog mushers and teams but evolved into today's highly competitive race. The current fastest winning time record was set in 2011 by John Baker with a time of 8 days, 19 hours, 46 minutes, and 39 seconds. The race is the most popular sporting event in Alaska, and the top mushers and their teams of dogs are local celebrities; this popularity is credited with the resurgence of recreational mushing in the state since the 1970s. While the yearly field of more than fifty mushers and about a thousand dogs is still largely Alaskan, competitors from fourteen countries have completed the event including the Swiss Martin Buser, who became the first international winner in 1992. "The Iditarod has a rich history and every year a new story is told. Alaska Airlines is honored to be associated with the race to help emphasize the success and safety of the mushers and their dogs." The airline will again present the Leonhard Seppala Humanitarian Award, which recognizes one musher for providing exemplary dog care and is considered the highest honor a competitor can receive. The award is named after one of Alaska's most-celebrated mushers, whose 1925 sled-dog team traveled the longest distance to transport diphtheria serum to Nome. As part of its sponsorship, Alaska Airlines also will provide air transportation and dog care supplies for Iditarod veterinarians who care for the race dogs' health and safety. In addition, many Alaska Airlines employees contribute their time at the event. The Dog Squad, staffed by airline employee volunteers, again will assist mushers and their dogs at the finish line. Several Alaska Airlines pilots will lead the Iditarod Air Force, flying veterinarians, supplies and volunteers to remote checkpoints along the trail.